CSI Mastermind Debbi Tehrani has found another intriguing Scene for us to investigate - from this inspiration image Debbi pulls five colours, lots of ideas for design elements and plenty of journaling prompts to get us going. Each week there is also a new set of CSI Coordinates designed especially for the case by the talented Michele Singh. These are printable images, journaling spots and patterned papers which CSI members can download and print off or use for digi scrapping - they're FAB and they're FREE!!! Amazing! and doodle a border with a fineliner pen. This sketch is so brilliant that I've used it twice already! I'm going to link this to the Sketch 365 July challenge as well - check out the Sketch 365 blog for lots of ideas and inspiration from the DT. There are several influences here from the Projects That Wow! online class which I've been following at Jennifer Grace Creates - mainly from the DIY Details prompt, but also Bling's The Thing and Pop and Slide! Intrigued? Check out Jennifer's blog as she always has lots going on. 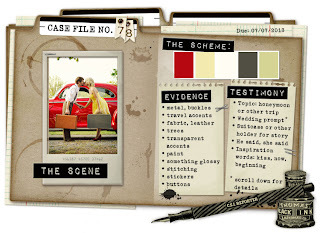 So, how did I solve the CSI Case File #78? Thanks so much for looking at my page - please let me know what you think of it! ps remember to enter my giveaway for the chance to win a gorgeous pack of ribbons from Scrapbook Fantasies - click on the Grand Opening Giveaway image at the top RHS of this page to go to the original post and leave a comment. Awesome layout. I especially like the little red dots. 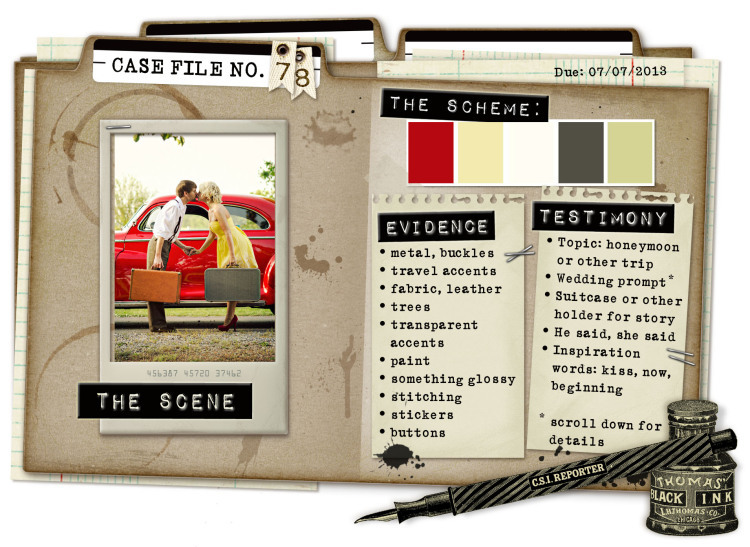 Super cute page Annie...love that photo, your layering and details! Love your styling on this one! hi there, you can join the ARC whenever you want. Just pick out your books for the rest of the year, blog about the list and link up then take it from there. I havent decided yet if I will do this next year. I might if enough people want to do it.